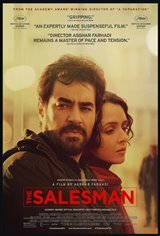 Excellent Iranian film about a man who seeks revenge for an attack on his wife. Expert direction by Farhadi. It is easy to why this film earned an Academy Awards nomination. It is thorughly engrossing and keeps you guessing right up to the end. This is a must see! The is a very rewarding film for its great length. Director Farhadi has been over some of the material before: the struggle of Iranian women to be completely free of patriarchy, love, anger, denial as a way of life and isolation. Neighbours so distrustful that they do not share information or support others because it will taint them by extension. And the most understated, intricate and surprising thriller. Nominated for best foreign language film, Farhadi and his great cast have been rewarded with a free public screening in Trafalgar Sq London, on Oscar night, both for the quality of the film and to draw attention to Trumps's shameful policy. It is a very smart thriller. Every scene has hints and meanings behind of it. Really loved it.